Start with two music educators, add one preacher, stir in a financial planner, and you could have the basic ingredients for any barbershop quartet. But 3 Men & A Melody is not your basic quartet. Tenor, Rob Mathieu, 2nd generation barbershopper, is a Kansas City based children's musician/performer. Not only does he teach preschool music, he performs interactive musical kids shows under the alias, Rockin Rob, geared for children 2-10 years old. Eric Derks leads the foursome musically but admits that telling jokes is not his forte. Brian Bellof is a second generation barbershop bass with a natural ability for showmanship. Baritone, Brad Stephens is the out-of-control comic of the four who keeps 3 Men & A Melody's audiences laughing. 3 Men & A Melody love what they do and have a high respect for the barbershop style. Their talent, energy, and enthusiasm are truly exciting for everyone to watch. 3 Men & A Melody's love of performing continues to escalate every day in hopes that they will be known throughout the Barbershop Harmony Society and the United States for their fun-filled entertainment and singing excellence. 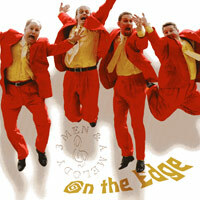 Ranked among the top Barbershop Quartets in the world, 3 Men have a strong and diverse musical background ranging from classical to contemporary to Doo-Wop, as evidenced by their varied repertoire on "Edge." 12 songs beginning with the Swing tunes "Hit That Jive Jack" and "Crazy Rhythm;" Big Band tunes "Sentimental Reasons" and "I Got You Under My Skin;" Franz Biebl's "Ave Maria," the Rock tune "What I Like About You;" Broadway hit "Someone Like You" from "Jekyll and Hyde;" and Kurt Bestor's touching "Prayer of the Children." There's tight harmonies and top-drawer entertainment from this impressive debut CD by versatile 3 Men & A Melody. With the 1998 Central States District Championship and some international competition successes under their belts, the 4 young men who are 3 Men & A Melody have decided to bring their powerful, intricate harmonies into the recording studio. 12 songs, some of our favorites: "Shoo Fly Pie and Apple Pan Dowdy," ""In The Wee Small Hours of the Morning," "Send In the Clowns," "Route 66," "Zombie Jamboree" and Harry Connick, Jr.'s "Recipe For Making Love." "Strictly" is a fun, energetic CD, very much like 3MAAM's live show, we would guess, and we're expecting big things of these guys.